# with "ctrl-0" before launching the animation. The Creation of a GUI for a script <<linked>> need a more complex organization than the one used for the classic scripts. Actually, It will be necessary to create two scripts : one for the GUI and the second that will linked to the scene. We can easily fancy that a script that would ask for the redraw of an interactive window at each frame would set up a few problems, at least the slow down of the redrawing. 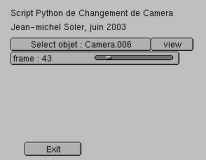 The main difficulty will be to pass information from one script to the other because each time the script is computed, the python space for variable names is cleaned. Thus we can not keep any value in a global variable from one script to the other. 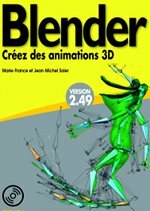 The only name space which is not updated is the one of the Blender module itself. The trick is to hang the needed information to it. On one side the data : the name of the object and the frame number. On the other side the processes applied to these data. In this list, we store the object name and the frame number in the shape of a new list made of these two exclusive elements! 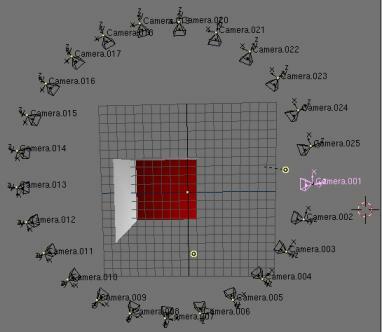 Once in the Blender.c list, these data are available, for reading and writing, for all the other scripts that would be simultaneously launched (or simply after) with the GUI. # an animation : GUI version. If the Graphical interface is relaunched, in its actual shape, the list is cleared out. Nothing prevent you from adding the necessary controls for clearing processes, management and maintenance. This would be available in the 0.2 version. # during an animation . # 1/ Launch the GUI : "alt-p". # 2/ select an object. # 5/ push the "select object"
# with the key combination : "alt-a". # Picking up the object : current scene. # for the current frame.